Common perceptions are that “oil is oil” and “grease is grease”. If that is the attitude that prevails at your company, there could be some expensive damage, or much worse, just lurking below the horizon. Most everybody knows, or should know, that mixing lubricants is generally not a good idea. Let's discuss some instances of where lubricants should never be mixed, with some real-life examples of what could happen. One of the common mistakes I see is using extreme pressure (EP) oils in backstops, or in gearboxes which have an internal backstop. I’m not sure what the reason for this is; all I can say is that it happens often. Most, if not all, backstops require the use of a non-EP lubricant in order to function correctly. The EP additive can prevent the backstop from working correctly. A backstop failure can have potentially fatal results (a failure could result in a conveyor dumping tons of stone or coal back into the tail area where someone might be standing around). If it is determined that a backstop is being filled with an EP oil, it is worth immediately investigating whether this lubricant is appropriate or not. If it’s not, a thorough flushing procedure will be required to ensure that all of the EP oil is removed from the sump of the backstop or the gearbox. 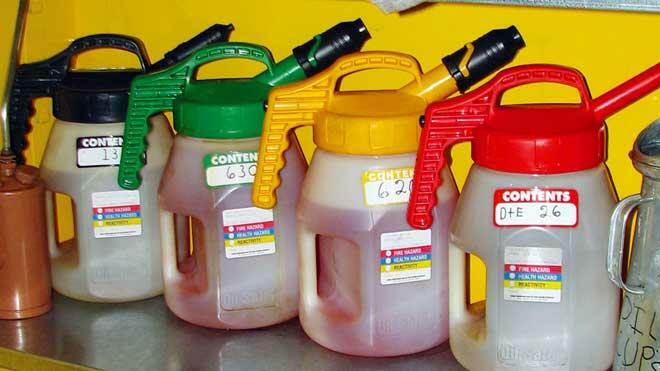 It is not sufficient just to start topping off the backstop with the oil that should have been there in the first place (often an automatic transmission fluid [ATF]) – EP gear fluids and ATFs are notoriously incompatible and can create some real issues if mixed. When the Society of Automotive Engineers (SAE) designed its viscosity grading system for automotive oils, it was not accidental that an SAE 40 oil and an SAE 90 oil actually have approximately the same viscosity properties, in spite of it being ostensibly a viscosity-grading system. One of the reasons for identifying similar viscosity oils with different indices is to highlight the difference in additive package. If people get used to the fact that a “90” is for gear trains and a “40” is for engines, then the chances of cross-contamination would be reduced. And that was a great design feature – putting an SAE 40 into a gear component would probably not be serious, but putting an SAE 90 into an engine requiring an SAE 40 certainly would be. From my experience of analyzing oil samples in laboratories, I would say the SAE has done a pretty good job of creating the perception of difference between engine oils and gear oils; but it still happens that these fluids get crossed-matched on occasion. You don’t want to let this happen. Another common mismatch of lubricants happens with coupling lubricants. 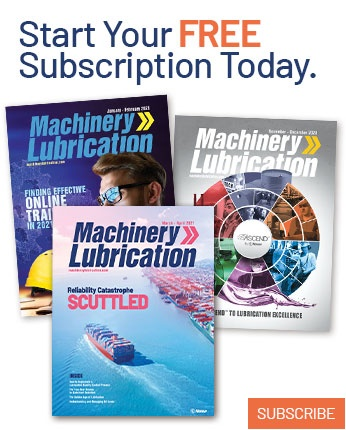 It might not always be an accidental mixing of fluids; sometimes it’s a desire to consolidate lubricants down to as few as possible in the warehousing system. As a result, it often happens that multi-purpose greases get used in grid couplings and gear couplings. This is really not a good idea. Couplings and bearings, for which the multi-purpose grease is usually suitable, operate under very different conditions. Bearings see relatively high speeds between the interacting components, while couplings (especially well-aligned couplings) do not. As a result of the relatively low speeds of interaction experienced within couplings, the viscosity requirement of couplings is much higher than for that of bearings. Also, couplings have to deal with very high centrifugal forces, which bearings do not have to. 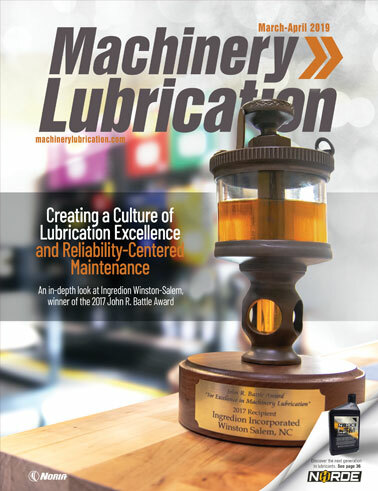 As a result, coupling lubricants need tackiness agents to ensure that the lubricant sticks to where it is needed. Mixing coupling and multi-purpose greases dilutes the additives required for good coupling operation. Hydrocarbon hydraulic anti-wear fluids, specialized applications aside, come in one of two basic flavors: those which contain zinc (an anti-wear and anti-oxidant additive) and those which do not. The former is the most common. Certain hydraulic components cannot tolerate zinc-containing fluids and, in the case of those using a zinc-containing fluid, can irreparably damage them. Typically, the zinc-free fluid will only be used in a couple of systems in a plant, with a conventional fluid being used in the rest. The result is a recipe for cross-contamination. The risk of cross-contamination can be compounded by the different identification of these products. At least one manufacturer has only a single-letter suffix difference between the zinc-containing and the zinc-free lubricants. Mixing oils and greases is not a good idea, and can have expensive production and safety repercussions. Good selection and lubricant identification systems are needed to ensure this does not happen.